Ivan Rakitic and Sergi Roberto have both been passed fit for Barcelona's Champions League tie against Manchester United. 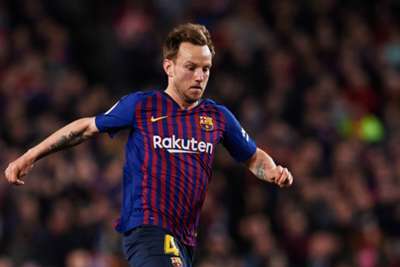 Rakitic and Roberto were among the absentees as a much-changed Barca side drew 0-0 at Huesca in LaLiga action at the weekend. However, the duo have been included in Ernesto Valverde's squad for the second leg of the quarter-final, which will be played at Camp Nou on Tuesday. Captain Lionel Messi is selected despite being left with a bloody nose and a swollen eye following a heavy challenge from Chris Smalling during the first leg. United also received a pre-match fitness boost with former Barca forward Alexis Sanchez and midfielder Nemanja Matic both named in their squad for the game. However, Ole Gunnar Solskjaer has a decision to make at left-back - regular selection Luke Shaw, whose own goal splits the sides after the first leg, is suspended.